The Final Campaign of the Eternal Struggle Against Neocolonial Exploitation had begun, and the 1st Revolutionary Combat Brigade of the People’s Democratic Republic of East Norkea had been given the task of leading the liberation march. In view of the importance of the impending battle, the major elements of Operation Crimson Chrysanthemum had been planned by Great Designer (and renowned military genius) Bri-An Tra-In himself. Colonels McCabe and Künüçen would conduct the operation on the battlefield. After the battle, the officer who best performed to the people’s expectations would be promoted, while the other would—at the very least—be executed. Imperialist forces have air superiority, but some heroic elements of the People’s Revolutionary Air Force may attempt strikes against enemy positions. The Great Designer plans Operation Crimson Chrysanthemum. The River Namgang is believed fordable, but may be difficult or dangerous to cross. The Great Designer must allocate maneuver units to Colonels Künüçen or McCabe, or keep them in off-table reserve. Artillery, observer, support, and special forces units remain under the control of the Great Designer. The Great Designer must provide detailed OPORDs to each maneuver unit, and provide each commander with axes of approach, objectives and a timetable for these. Failure to meet these will result in demerits. The Great Designer should preplan all preparatory and programmed fires on the basis of his inspired Revolutionary Logic of Enlightenment. As per the Principles of Democratic Centralism, only the Great Designer may change OPORDS. The field commanders are solely responsible for their tactical implementation. Motor rifle platoons may be assigned to ride upon the tanks of a tank platoon, in which case they are assumed to have similar orders. Unused trucks remain in reserve. Up to one Special Forces platoon may be ordered to attempt a heliborne landing via 2 Mil-8 transport helicopters. The route, objective, and time for this must be preprogrammed. Up to two Special Forces platoons may be ordered to infiltrate disguised as refugees. These will be revealed when the Great Designer chooses, or if they are spotted by imperialist forces. Up to three Special Forces platoons may be ordered to secretly infiltrate the flanks of the enemy position at any preplanned location farther than 500m from the west edge of the table. These will arrive—if at all— via random event. In his fortified bunker far from the battlefield in the East Norkean capital of Yongping, the Great Designer immediately set about developing a plan of diabolical proletarian cunning. The main striking force, led by Colonel Künüçen, would consist of the fastest troops: two companies of T-72s, with infantry riding atop. 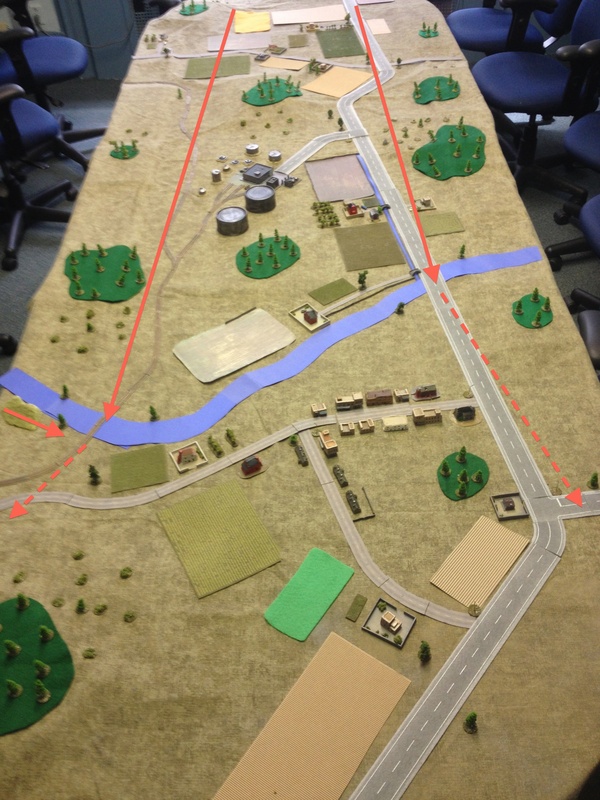 Proceeded by the BRDM scout platoon and supported by the AA platoon to their rear, their orders were to press westward along the highway to the road bridge with all possible haste. Specific instructions were given that they should only briefly respond to enemy fire, then attempt to break through any resistance. At all costs they were to avoid being drawn into a prolonged firefight. 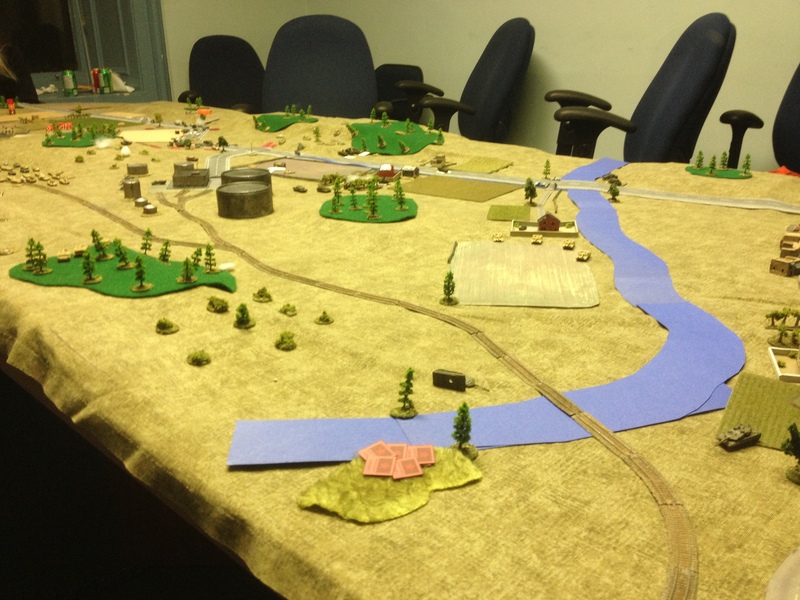 Once the bridge was captured, half the force would be deployed to hold it, while the remainder would continue the advance to the west (and off the table). A second strike force, commanded by Colonel McCabe, comprised a company of T-55s, an infantry company mounted in BMP-1s, and the heavy weapons platoons of the Motor Rifle battalion. These would advance towards the railway bridge along a parallel axis of attack. The Great Designer’s cunning plan (based on the original sketches on display in the Great Hall of Tra-Inist Awesomeness). The Great Designer plotted an impressive array of preparatory and programmed fires to support the operation. He also assigned appropriately special tasks to the Special Forces, who— inspired by Tra-Inist thought—were eager to undertake any mission, no matter how dangerous, in the service of the Revolution. The first and second platoons were ordered to infiltrate among fleeing refugees, and then attempt to sow panic and confusion in the rear of the enemy. The third platoon was to infiltrate overnight into a position from which it might assault the western edge of the railway bridge. Final victory over the rotting edifice of late capitalist neoimperialism would soon be at hand! Delay the enemy’s advance while inflicting maximum casualties so as to disrupt their operational tempo. Additional forces are en route to reinforce your position. Deny use of the road and railway bridges over the Namgang River to the enemy. 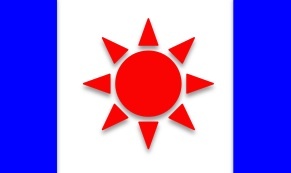 Assist any West Norkean refugees fleeing from the enemy assault. Coalition forces have air superiority, but localized activity by enemy aircraft cannot be ruled out. You are all that stands between democracy and despotism, between neoliberalism and brutal fanaticism, between righteous decency and terrorism. The people of West Norkea, and indeed the entire Mainly-Free World, are looking to your bravery and shining moral example. The River Namgang is fordable, but counts as difficult terrain. Coalition forces may not fire at or through refugees. You may move refugees in your turn at the appropriate foot or vehicle movement rate in an attempt to have them successfully exit the western edge of the table. Coalition politics are difficult. West Norkean units will not always accept your orders. You are permitted two preregistered defensive fire (DF) and 1 final defensive fire (FDF) targets for off-table artillery. 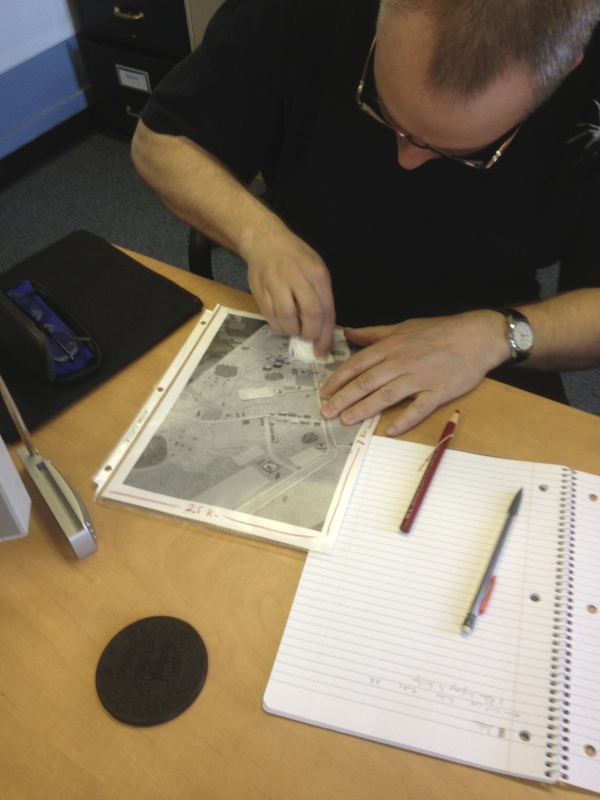 Each turn you may request any two of: additional intelligence, air/artillery support, or ground reinforcements. Success becomes more likely as the game progresses. If you request only one, your chances of success are also increased. After conferring, the Natonia commanders decided to build their operational plan around the expectation that the East Norkeans would attempt a major armoured thrust down the main east-west highway. To blunt this, they configured a kill zone running from the crossroads east of their forward position to the turn-off to the chemical plant (marked in red on the map below). 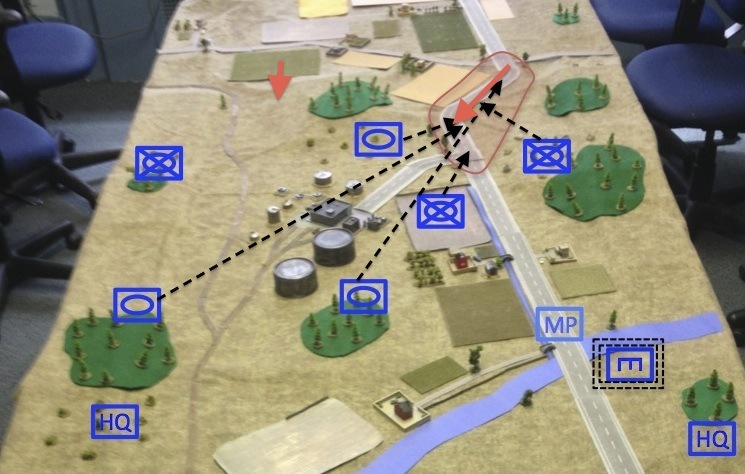 Two dismounted Stryker platoons and a tank platoon would execute the ambush shortly after enemy forces entered the box, and would continue until they reached its western edge, at which point they would fall back to a second defensive line approximately 1km to their rear. The two other tank platoons also could target the kill zone, and would provide covering fire if the forward elements were forced to retire. 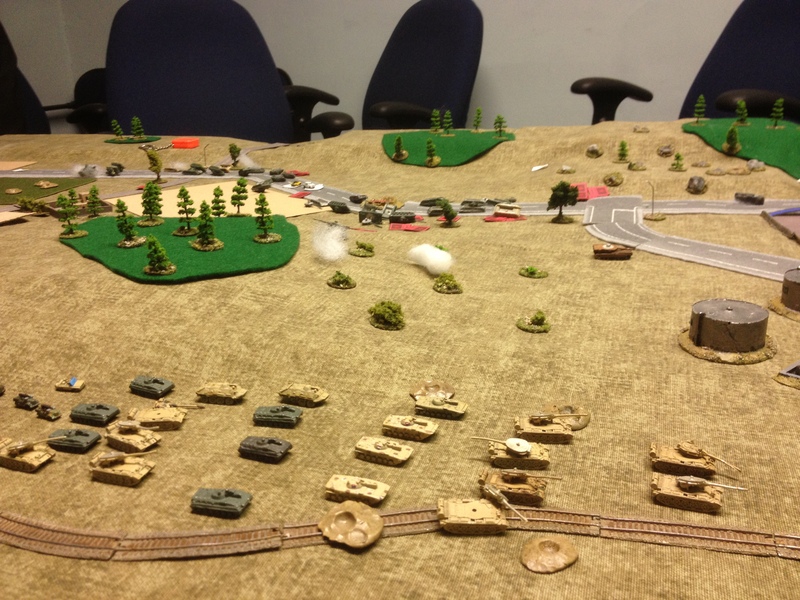 The highway was cratered in the midpoint of the kill zone, and artillery prergistered on it. 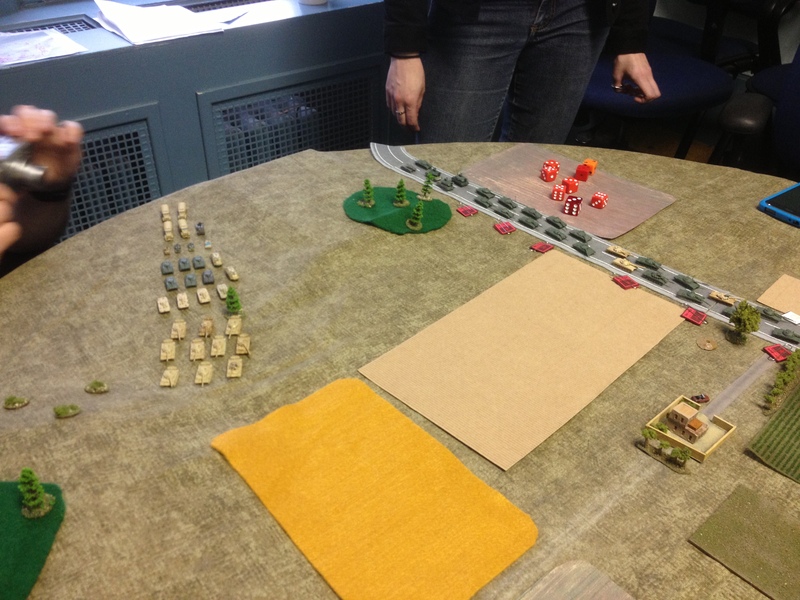 Should the second defensive line be breached, Natonian units were to withdraw to the railway bridge, where dug-in positions had been prepared. The main highway bridge was rigged for demolition, and would be blown upon the approach of enemy forces by an engineering platoon entrenched on the western bank of the Namgang River. 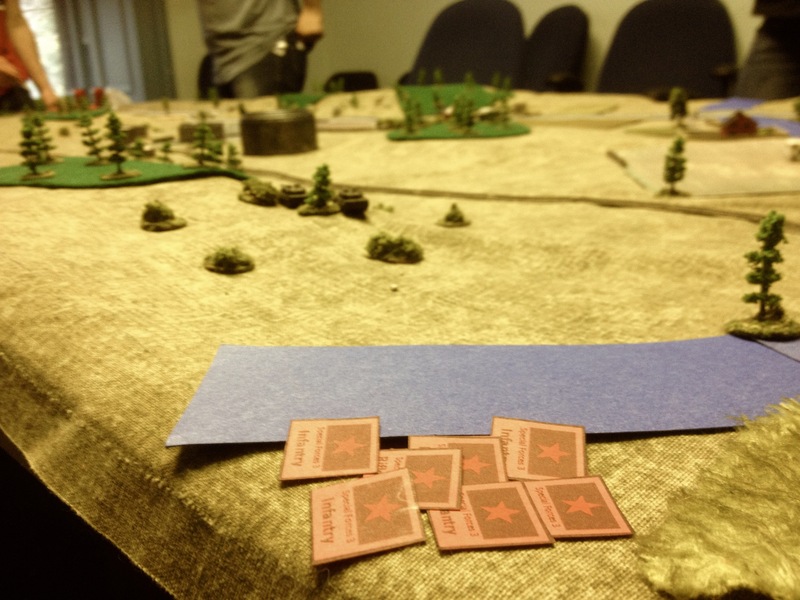 A West Norkean MP platoon secured the eastern edge of the bridge, where they were tasked with assisting refugees. The first indication that the attack was imminent was the screeching roar and thunderous crash of over a thousand 122mm rockets, as the East Norkean rocket artillery softened up the defenders. Lacking precise intelligence as to the Natonian positions, however, the barrages all fell short of the defensive line, killing only a small group of Norkean refugees. The two huge armoured columns then began their advance. 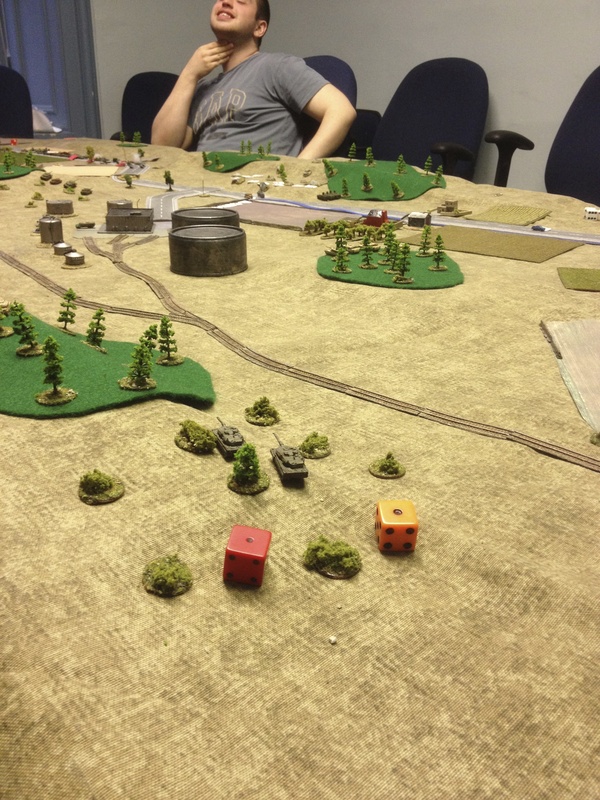 The defenders were careful to hold their fire, however, until the enemy was within the designated kill zone. Elements of the East Norkean 1st Revolutionary Combat Brigade advance in column. Just then, COL Fisher received some troubling intelligence: some of the treacherous East Norkean forces had apparently disguised themselves as refugees! An order was dispatched to all units to show extra vigilance. This soon payed off, when the infantry platoon deployed along the rocky valley slopes south of the highways spotted two vehicles acting suspiciously. These—which were indeed East Norkean Special Forces, headed towards the bridge in civilian vehicles—were soon riddled with small arms fire and the threat neutralized. The Great Designer recieved some information too, from his network of spies, informants, and faux refugees: a Natonian tank patoon was deployed on the western slopes of the central hill. Clearly the enemy planned to ambush them on the highway. Ha! In his bunker in the distant capital of Yongping, the Great Designer laughed in the face of such danger. Operation Crimson Chrysanthemum would be executed as planned, with the revolutionary élan of his troops sure to guarantee a breakthrough. 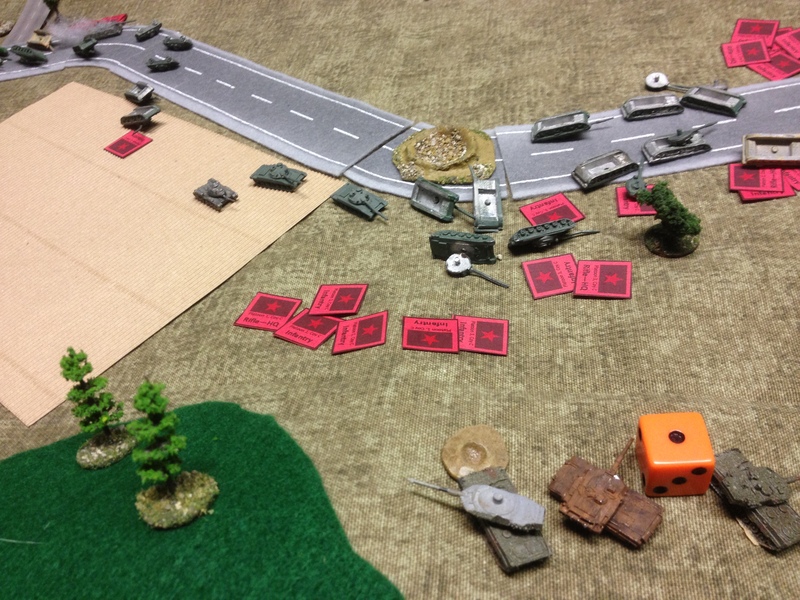 Moments later, the lead BRDM platoon radioed that the highway had been cratered ahead, forcing a short detour. It was the last message they sent, for moments later they came under fire from a platoon of Abrams and were destroyed. 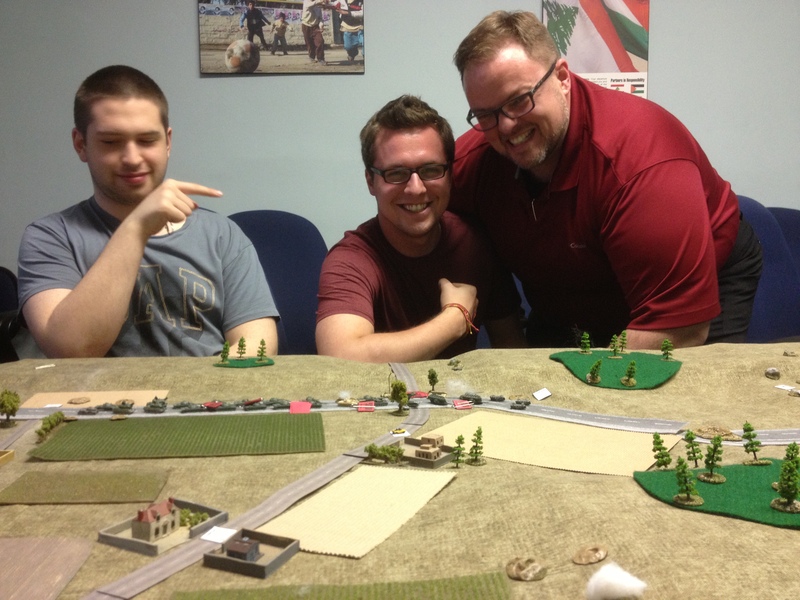 COL Fisher and MAJ Anderson rejoice as Natonian forces draw first blood. Special Forces platoons #1 and #2 had accomplished little disguised as refugees, in part because the roads westwards were increasingly blocked by the East Norkean main force. Special Forces platoon #3, however, encountered rather more success as it infiltrated unseen near the railway bridge. At the bridge itself, empty entrenchments stood unguarded. Across the river, however, the two company command tanks of the Abrams platoon could be seen positioned among scrub on a hillside. They were—just barely—within RPG range. Should the commandos press on to their objective, or take the shot? East Norkean Special Forces infiltrate along the river bank. In the distance, at the very edge of RPG range, they spot a tempting target: the rear armour of the unsuspecting command tanks of the Natonian tank company. They decided to take it. A hail of RPG rounds were launched towards the Natonian armour. Miraculously one round hit each vehicle…. …and both rounds were duds. Shortly thereafter, the Great Designer had the manager of State Armaments Factory #11 arrested. Two poorly-made East Norkean RPG warheads prove to be duds, after hitting the rears of both Abrams at extreme range. Meanwhile, back at the ambush site, the highway rapidly became a cauldron of death as tank shells, artillery, and missiles pummelled the East Norkean column. The second, slower column of East Norkean forces remained out of contact and unable to assist, its line-of-sight to the main action blocked by the central hill and woods. The trap is sprung. 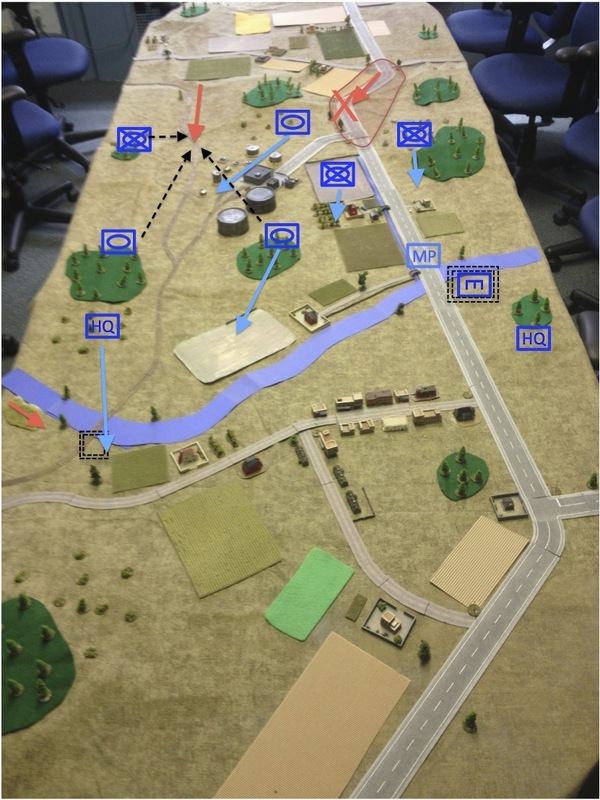 Two Natonian infantry platoons, three tank platoons, supporting artillery, and even a Predator drone all fire upon the first East Norkean column as it enters the kill zone. Despite the overwhelming firepower inflicted upon them, the forces of the Great Designer fought back as best the7 could. The ZSU-23-4s of the anti-aircraft platoon poured hundreds of rounds into the rocky slopes of the valley hillside, eliminating the Javelin ATGM teams there and forcing a Natonian infantry platoon to retire. They also shot down a MQ-9 Reaper drone that had arrived to support the defenders. The Natonian fire support team, hidden on the roof of the chemical plant, responded by zeroing in their supporting artillery on the lightly-armoured AA, and destroyed it. As if to emphasize his point, a barrage of rockets fell upon the hillside a mere 500m from his position, briefly neutralizing the enemy tanks there. With this, the remaining East Norkean infantry moved to the attack. 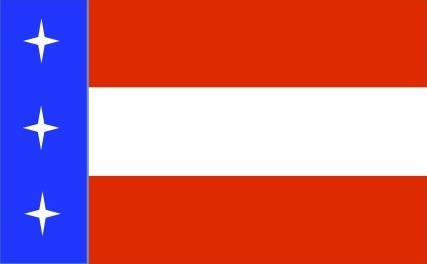 The nearest Natonian armour, deployed forward with little immediate infantry support of its own, began to retire. So too did the remaining Stryker platoon, deployed behind a stone wall at the eastern end of a field overlooking the highway. Another barrage of rockets landed upon them as they did so, inflicting significant casualties. Colonel Künüçen’s valiant last stand in the “Cauldron of Death,” surrounded by the destroyed vehicles of his erstwhile command. One Abrams has been destroyed, but faulty East Norkean ammunition fails to penetrate a second. Several platoons of East Norkean infantry begin to rally and advance—eventually forcing Natonian forces to begin a withdrawal to their second defensive line. Back at the railway bridge, the HQ elements of the Natonian tank company fired upon the Special Forces, but soon lost sight of them as they hid within a nearby marsh—and then lost one of its vehicles to a flank shot from an RPG when it wandered too close. An Apache attack helicopter was called in to aid in the search, but fared no better in finding them. 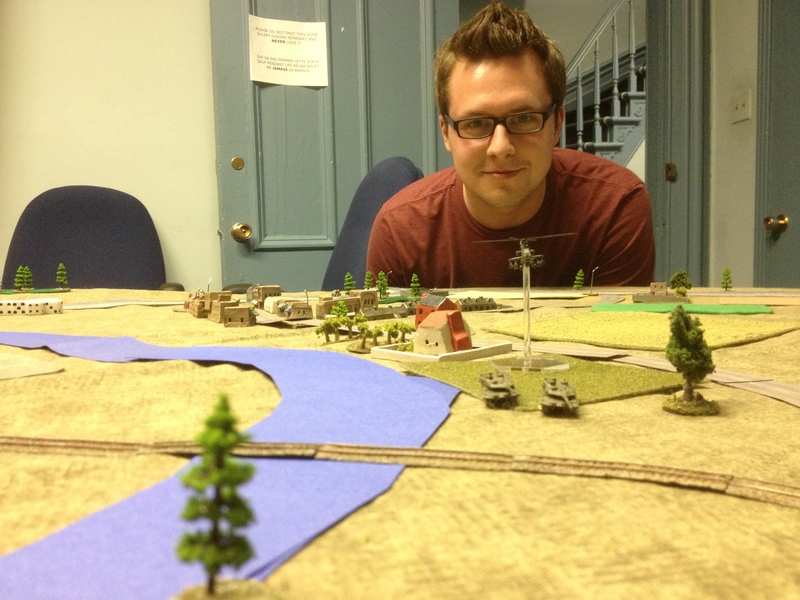 MAJ Anderson, smugly boasting about the merits of peace through superior firepower. Moments later his command vehicle would be ambushed and destroyed by an elusive band of East Norkean commandos. Finally, the second East Norkean attack column led by Colonel McCabe rounded the central hill. It was too late to help her compatriots, however. Instead, her forces were promptly engaged by the ATGMs of the Natonian infantry platoon hidden in the foliage on the north side of the valley, plus two platoons of tanks. With her T-55s incapable of penetrating the front armour of the Natonian M1s, there was little she could do to respond. The second East Norkean column comes under attack. With the front line looking increasingly secure, a Natonian tank platoon was ordered to assist in dislodging the East Norkean commandoes from the marsh near the railway bridge. A platoon of Natonian armour heads towards the railway bridge. 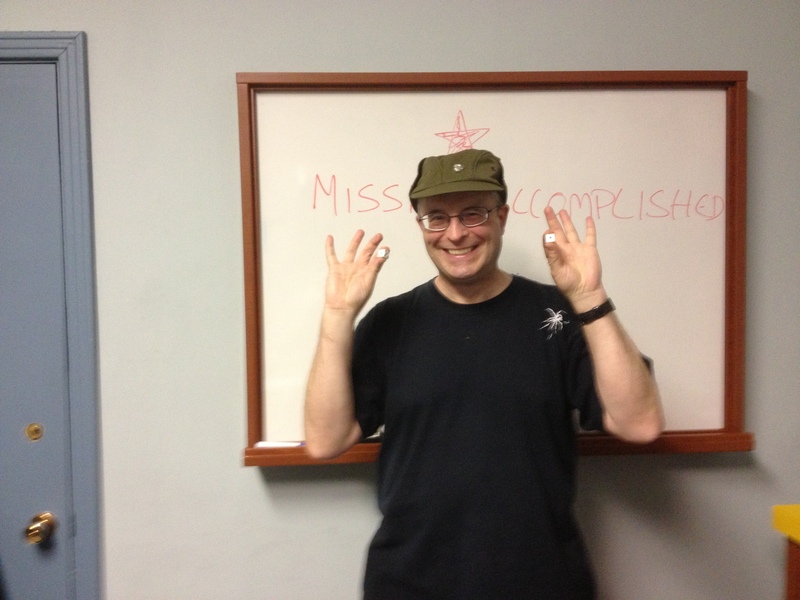 Great Designer Bri-An Tra-In celebrates his “victory” at the Battle of the Cauldron of Death. Although the score looks lopsided, the game was closer than it looked—had the East Norkean commandos succeeded in their attack on the Natonian headquarters, they also would likely have captured the railway bridge and boosted their total to 28 points or so—within striking distance of victory. I umpired the game rather than played, so let me offer a few thoughts on how it all progressed. A hybrid of (old) Wargames Research Group first and second edition rules were used for the game. Brian and I had first met in the early 1980s playing with these rules and this microarmour, so the game was a wargaming reunion of sorts. The Natonian ambush against the main East Norkean column was an outstanding piece of planning. Lines of sight had been carefully determined before the battle, artillery preregistered, and fall-back positions pre-identified. The cratering of the road helped slow the attackers at a critical juncture. By contrast, the decision to leave the railway bridge unguarded could have cost the Natonians the game. They had also deployed all of their combat assets forward, leaving nothing in reserve. If they had been waiting for ground reinforcements, these (by the luck of the dice) never arrived. The East Norkean attack had been very carefully planned too. The attacking forces were split between two axis, however, which may have dissipated their combat power a bit. Moreover, the slower movement of the second column meant that it advanced too slowly to provide supporting fires for the first when it was ambushed. It might have been better for the East Norkeans had they assigned two or all three of the Special Forces companies to flanking/infiltration maneuvers. Indeed, the Natonian engineers at the highway bridge had orders to blow it if the enemy approached, so the infiltration of East Norkean commandos near that location might have sparked this. It was nice to have a long table to enable some defence in depth (in scale, about 7 km x 2.5 km). It might have been a little too long however, and a little narrow—although this was rather reminiscent of Korean valleys. While a few more forces might have been assigned to the attackers, the overall balance was fairly close. Overall, I very much enjoyed umpiring the game—I hope the players all had as much fun.